A new study examines how various insects act as tiny trash disposals in New York City's public spaces. Incredibly, these bugs eat thousands of kilograms of our waste each year. New York is one of many cities whose mythical allure claims that the streets are paved with gold. Sadly, you are more likely to be treading on – or at least wading through – the remains of burgers, hot dogs, sweets, cookies, fries and more unmentionable sources of nutrients. Yet in among all that detritus is an awful lot of energy, a resource that could underpin a complex ecosystem. Food webs are a staple of ecology research, but usually explored in rain forests and coral reefs, ponds and savannahs. However a team at North Carolina State University has recently turned its attention to the much more dangerous terrain of Manhattan to find out if the insects living on and under the streets clear up a significant amount of the food litter – and whether the diversity of species makes any difference. Their results are published in the journal Global Change Biology. The precise relationship between resources and the diversity of flora and fauna in ecosystems has been the subject of intense research ever since the coming of the word "biodiversity" in the late 1980s. Ecologists were challenged to explain the role of species: does it matter how many there are, does the number of species affect the way ecosystems work, what do all these species do for us? All this activity drives the natural ecosystems which keep us alive. Ecosystems are more productive, efficient and resilient the more species they contain, perhaps because different species carry out complementary roles or, however unwittingly, benefit the activities of others. The North Carolina team set out to test whether the diversity of invertebrate street life affected the removal of food that had suffered "improper disposal" (a charming politeness runs through the whole study) in the parks and elongated traffic islands of Manhattan. To audit the pavement biodiversity, the team collected insects from among the leaf litter, with additional forays into other areas in search of ants. The rate of food clear-up was measured by putting out potato chips, cookies and hot dogs and seeing how much was left the following day. Some of the food was protected by wire mesh, others not – so that larger creatures such as rats and pigeons could get in too, to allow for their impact. The precise brands of crisp, cookie and hot dog are detailed, each cut up into more appetising chunks. This is important, allowing experimental replication with street food around the world. For example in Britain the late-night kebab might be a significant bio-geographical variation. The rate of food clear-up was compared to the overall diversity of invertebrates and the precise mix of species. Sadly, nowhere do the team members outline how they explained any of their activity to passing policemen. The speed with which food was removed proved startling. In the first run of the experiment using small chunks of food, 59% was gone within 24 hours. A second run using larger portions resulted in a 32% loss within a day. Whole cookies and chips … gone, chunks of hot dog … vanished. The insect life on the traffic islands consumed supplies two to three times faster than the inhabitants of the parks. Life in the fast lane perhaps, or maybe the park life was more used to ice creams and sandwiches. In either locality, hot dogs were preferred to the light snacks. In total the insects from the medians and traffic islands of two long Manhattan streets – Broadway and West St – could remove the equivalent of 600,000 potato chips per year. This could become a standard measure of invertebrate junk food ecosystem services. The overall conclusion is that our invertebrate neighbours in the city make a notable contribution to the removal of litter. However the food clear-up was not affected by the diversity of species. More important was the presence of one species of ant, the perfectly named pavement ant, Tetramorium caespitum. 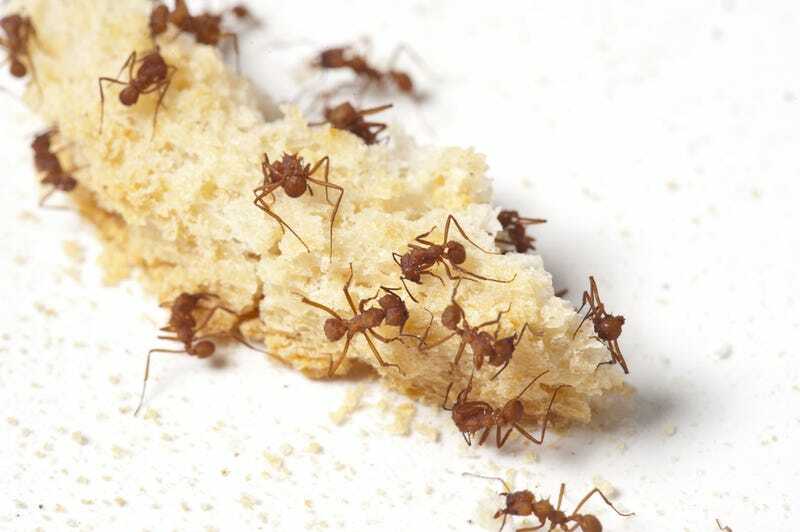 Two to three times more food was removed where these particular ants were present. There is something particularly pleasing about it being the pavement ant. Not just the name; this ant is not a native New Yorker, but an immigrant from over a century ago, probably coming from Europe to the Big Apple. Urban wildlife is often rather overlooked as a sorry mix of second-rate left-over habitats and dodgy aliens. However the city represents a whole new habitat, likely to become ever more widespread; a zoopolis, with a distinct and fascinating ecology. Where the streets are paved with last night's food, these ants have certainly found their niche. The article originally appeared at The Conversation and is republished here with permission.